What does is look like to finish the race well? This is a question that every Christian and every minister must answer. In seeking to live a life of faithfulness to Jesus, we all will face challenges, hard times, and difficult situations through which we are called to faithfully cling to God’s own grace and faithfulness to us. 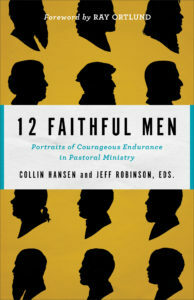 In 12 Faithful Men: Portraits of Courageous Endurance in Pastoral Ministry, Colin Hansen and Jeff Robinson put forward twelve examples of what faithful ministry looks like. 12 Faithful Men traces the stories of men from different generations within church history through essays from various authors that give a biographical sketch of the man’s life as well as helpful principles that can be applied to everyday ministry. These stories include the lives of well-known figures such as Calvin, Bunyan, Edwards, Spurgeon, and Newton as well as lesser known figures like John Chavis, Janani Luwum, and Wang Ming-Dao. Throughout each story, readers were helpfully drawn into the context and struggles of the man whose story was being told while being challenged to minister with faithfulness till the end. Colin Hansen and Jeff Robinson have developed a helpful and encouraging resource for those seeking to serve the Lord in ministry. Throughout the book, readers are reminded of God’s presence and sufficiency even in the midst of trials. This is a reminder that every minister must cling to as he or she seeks to be faithful.